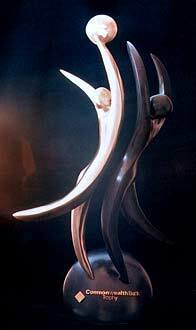 This national trophy was created using the 'lost-wax' process. I sculpted the original piece in wax and timber. When the four pieces of the trophy had been cast, they were hand finished using grades of finer and finer sanding grits and then polishing pads. The bronze pieces were then coloured, 'patinated', by applying different degrees of heat and a variety of chemicals. The figure on the right was 'tig' welded to the base and the other figure was pinned to the base. The lettering was laser cut from acrylic, then 24k gold-plated using a sensitising solution. The letters were then individually adhered to the trophy. A wax finish was then applied by hand to render a durable finish and enhance the colours of the bronze.